When you spend hours on your feet working finding comfortable boots is a must. Whether you are military personnel, an EMT, Firefighter or Law Enforcement Officer, you want to be focusing on your job and not be hindered by uncomfortable or ill performing work boots. That is why it is important to take the time to find the best pair of work or tactical boots for your type of employment. What should you be looking for in work boots? Are zipper work boots better than work boots that lace up? While there are many criteria for selecting work boots, the first question – and one way to narrow down your choices – is whether or not you want work boots that lace up or have a zipper. So why choose zipper work boots? Zipper work boots versus boots that lace up is always a hot debate. There are pros and cons to both sides, and preference often comes down to what type or work you find yourself doing. Boots with zippers on them are much easier to take on and off, which make them ideal for EMTS or firefighters who are called out to an emergency with little notice. It also makes them ideal for situations where you are constantly transitioning from the field to offices, so you can change into shoes and avoid tracking dirt everywhere. Another benefit of zipper work boots is that every time you slip into your boots, they will fit you the same. Unlike boots with laces that need to be untied and snugly retied every time, zipper boots will fit you the same day in and day out. While there are many benefits with zipper work boots, the two main concerns are that they will not fit as securely since they are not adjustable, and that if the zipper breaks, the boots are essentially useless. Those drawbacks can be avoided by taking the time to find quality zipper work boots that fit you well from the start, preferably ones with laces as an additional option, and meet the specs that you need for your job. But what should you even be looking for in zipper work boots? When you are looking for zipper work boots, your search criteria will be much of the same as when you look for work boots that lace up. Once you have determined that you want zipper work boots, you will eliminate many options and make your final selection process a bit easier. One of the main concerns that deters people from zipper work boots are that they do not fit as snugly as boots that lace up and can be adjusted. That is why it is important from the start to find zipper work boots that fit you very well and are comfortable. There are also many zipper work boots that also have laces. Be sure to try them on with the type of socks you normally wear at work and be conscious of any areas that feel tight or loose. Whether or not you want a zipper on the back, front or side of the boot is also important. This is generally a preference that people have and is something to keep in mind through the process. Another important element of work boots is traction. You want to focus on your job and not worry about slipping and sliding about. Having boots with great traction will keep you steady and upright, which is important. Another factor is how waterproof and breathable the work boots are. If you are working outdoors, especially around bodies of water or where it often rains, you will want to be sure that your work boots rate well in how waterproof they are. Additionally, finding boots that are breathable will help keep your feet – and you – cooler and less sweaty. Finally, shock absorption is another thing to keep in mind. You want to have boots with good soles that will provide long lasting comfort for the days and nights you’re on your feet. There are many different options when it comes to zipper work boots. With various brands, models and specs to consider, it is easy to become overwhelmed. That is why we took the time to sort through countless different types of zipper work boots to narrow it down to the top five. The 8” Maelstrom Men’s TAC FORCE boots are superior tactical boots that are also affordable. They come in two colors, tan and black, so you can choose your preference, or whatever works best for your uniform requirements. The Maelstrom Men’s TAC FORCE 8 Inch Military Tactical Work Boot with Zipper are constructed with a combination of leather and fabric. They feature a rubber sole that provides traction and comfort. There is even a shock absorbing cushion that can be removed, which provides comfort for the days you spend a majority of time on your feet. While these are 8” work boots, the boot shaft measures 7” from the arch and they feature a side zipper as well as laces. The leather is able to be polished so you can keep them looking presentable, and they also feature a moisture-wicking lining that makes them more breathable than some other options. Additionally, the outsole is slip resistant and can even handle surfaces that have been slicked with oil. If you are looking for tactical zipper work boots, the Maelstrom Men’s TAC FORCE 8 Inch Military Tactical Work Boot with Zipper could be a good option if they fit well. Thorogood is a strong brand with quality products and the Thorogood Men’s 8” Side Zip Jump Boot Gen Flex does not stray from this notion. For those that like the look of an all-black boot with a side zipper, the Gen Flex might be a good option. It is constructed with oil tanned leather and a high shine toe cap and heel for added protection. There are also laces so that you can make slight adjustments and ensure that you are met with a comfortable fit every time. With a Goodyear Welt construction, a Gen EX Dual Density Rubber outsole and two Density Polyurethane Removal inserts, you can rest assured that these boots will provide the long lasting comfort you need. There is also a Dri-Lex Aero-Spacer lining that offers breathability. These hearty zipper work boots won’t leave marks and are slip resistant. They also offer a shock absorbing midsole to give even more comfort during those long work hours. They are a bit heavier than some of the other options, but the quality is unparalleled when it comes to zipper work boots that are built to last. Smith & Wesson are known for quality products and the Smith & Wesson Breach 2.0 Men’s Tactical Side-Zip Boots certainly deliver. 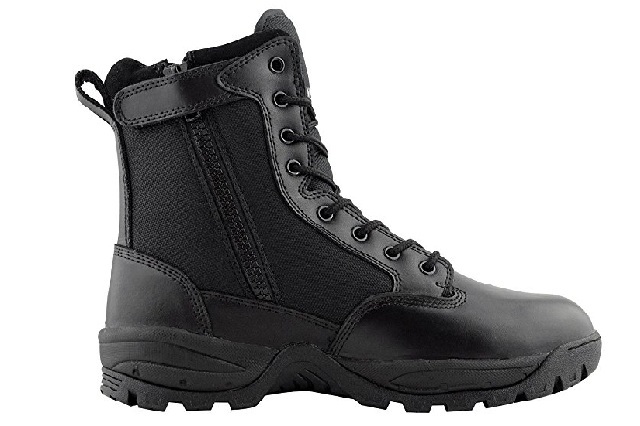 These boots feature a side zipper and build on the already successful Breach tactical boots. They are built to last with tough leather and nylon construction. The gusseted tongue is also great for keeping dirt and stones out of your boots. This is especially crucial if you are always on the go and won’t have time to stop and remove pesky stones or debris from your boots. The EVA midsole also offers some shock absorption that adds a bit more comfort to the boot. They are more lightweight than some other models, which will save a bit of energy when compared to heavier boots. What they lack in weight, they don’t give up in support and protection. A steel shank is incorporated to keep your feet safe and reduce foot fatigue. These boots are also slip resistant, which makes them great for work or tactical boots. The rubber outsole is built to increase traction. It is specifically designed to grip dirt, fences, ladders, and even waxed surfaces. In addition, the all black tactical boots offer laces so that you can secure the perfect fit. These boots are built to last, and if you like the fit, the Smith & Wesson Breach 2.0 might be a great option for you. Another option for quality work boots is the Bates Men’s Velocitor Zip Waterproof Work Boot. These boots come in a sleek all-black design, but also deliver when it comes to performance and comfort. The leather boots feature a synthetic sole with a YKK nylon side zipper. They are built to last, with a shaft that measures 6” from the arch. If you are looking for a mid-height boot, these could be a solid option. There are also shoelaces to help you adjust the boots for maximum comfort. The Bates Men’s Velocitor Zip Waterproof Work Boot are waterproof and breathable. This is a great feature, especially if you are working outdoors and often face hot temperatures, high humidity, and rain or bodies of water. If you are looking for comfort, you can also find that in the Bates Men’s Velocitor Zip Waterproof Work Boot. They offer a dual density cushioned inset and vinyl acetate midsole, as well as a durable rubber outsole and strong arch support. Though these zipper boots are more costly than other options, they are built to last. The Timberland Pro Men’s Valor McClellan 6 Inch Work Boot with Side Zip are another option when it comes to the top zipper work boots. Timberland is a brand of boots that has been around a long time and they have worked hard to create quality boots that deliver in every category. These black leather work boots feature a side zipper, as well as laces. This is a great feature to help adjust the boot slightly to give you the best fit possible. The zipper still makes it possible to quickly remove and slip on the boots, which is essential for many lines of employment. The premium leather uppers keep your feet dry, while the suede linings wick away moisture to keep your feet cooler and less sweaty. For hot and humid work environments, this is crucial. Additionally, these boots provide comfort with leather covered OrthoLite foot beds. When it comes to performance, the Timberland Pro Men’s Valor McClellan 6 Inch Work Boot with Side Zip also delivers. They offer a durable rubber lug outsole that provides superior traction, even in the slipperiest of situations. If you are looking for zipper work boots that are both sleek in design and provide comfort at an affordable price, the Timberland Pro Men’s Valor McClellan 6 Inch Work Boots are an option to consider. It’s important to remember when you are looking for the best zipper work boots that no one pair of boots is a great fit for everyone. You need to carefully consider what the most important features in a work boot for the type of work that you do are. If you are constantly on your feet then comfort and shock absorption might be most important. If you will be outdoors facing inclement weather, then having a waterproof and breathable work boot will be critical. Take time to carefully consider different types of zipper work boots and make sure that you try them on. Boots fit differently and you cannot rely on ordering your regular shoe size. For a boot that will be on your foot for long hours almost every day, ensuring that they fit is paramount. If you take time to do the research now, you will be much happier in the long run when you’ve selected the best pair of zipper work boots for yourself.